In the north transept of Salisbury Cathedral are the graves of Charles William Wapshare and his wife Mary, Charles was the son of William Wapshare of Eastrop, Wiltshire. They first lived in Malmesbury House in the Close then Symondsbury Place at the bottom right of the photo. William Wapshare was born in Eastrop, Highworth, Wiltshire on 20 June 1715. He married Elizabeth Dench at East Wellow in 1746. They were the owners of Dunwood Manor at Wellow near Romsey which is today a golf club and retirement home. After the death of his son, William leaves Dunwood to his grandson Charles on reaching the age of 21. He also makes reference to his nephew Charles who was on board H.M.S. Osprey. William and Elizabeth had one son Charles Wapshare who was born on 21 June 1750, In 1763 they were living in the Close of Salisbury Cathedral at the house next to St. Ann’s Gate now called Malmesbury House. A house where King Charles I had sought refuge some years before. At that time there were two houses and in the other lived James Harris, the grandfather of James Harris the first Lord Malmesbury. Sadly Elizabeth died in 1771 when her son Charles was just 21. In 1774 Charles married Mary Sandford, The daughter of Nathanial Sandford, vicar of Purton and Chicklade, Wiltshire. Mary’s mother had died in the year she was born and most of Mary’s seven children were to follow academic and religious vocations. With a growing family in 1779 William took a lifetime lease on Symonsbury Place which had been left to Wadham Wyndham. This was a larger house, formerly a residentiary cannonry built in 1660 which gave William space from the household of Charles and Mary. The house is now in three divisions, the Deanery and the Registry. William and Charles were both Lawyers and seem to have made good profits from the controversial Enclosures Act. At the Grateley Enclosures in 1778 they set up a sales meeting at The Star and Garter in Andover on behalf of the government to dispose of land that previously had been common. Their residence in the Close was only a stone’s throw from New Street where several Lawyers Chambers still make good profits (as I have discovered!) William had enjoyed an extensive career and some case notes are included here. 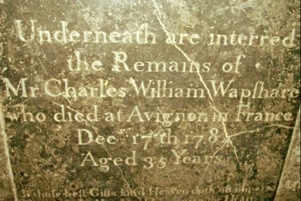 But in 1784 Charles died in Avignon. After the 1783 Treaty of Paris many Englishmen including Pitt and Wilberforce went to visit France in those few years before the Bastille. Things were going badly for the French and their economy was in a desperate state, partly because of their support for the American Revolution. After the French Revolution in 1789 travel in France was less easy for the English but they stayed on in Nice which was in the Kingdom of Savoy. Charles’ remains were brought back to Salisbury Cathedral and buried in the north transept but we still do not know the reason for his death. His father, William, must have been totally devastated and he died a few months later in May 1785. Obituary. Monday 17 Jan 1785, Salisbury and Winchester Journal.- On 17 Jan 1785 , died at Avignon on his way to Nice. Mr. Charles William Wapshare, attorney at law of the Close. Independent and of great professional knowledge, avidity and integrity of this amiable and deservedly lamented young man, he was blessed with a very refined, as well as much understanding and above all, with such goodness of heart, has rendered him one of the best Sons, of Husbands and of Fathers. In his will Charles left his books and philosophical and medical instruments to his son Charles. There is reference to estates at Potterne, Wiltshire. His father William leaves the Dunwood Manor to his grandson Charles, first son of Charles, but all of the goods and furniture at the Close and Dunwood are to be sold to provide an education for his grandchildren and rent for Mary at 7 Bishops Walk (Symondsbury Place) provided that she remained unmarried. Six years later in 1792, Mary Wapshare, widow, was granted the lease of Symondsbury Place at twenty shillings a year for forty years. In ten years of marriage, Mary had seven children. Charles b 1775 lived to 82, Mary b1777 lived to 47, Emma Elizabeth b 1778 death unknown, Peter Benson b 1780 died at 12, Frances Charlotte b 1781 lived to 70, William Sandford b 1783 lived to 38 and James b 1784 lived to be 90. All of these have pages which follow. Peter Benson Wapshare who was Christened on 30 Dec 1780 and died tragically on 28 Oct 1793, nothing more is known of his life and he has been omitted from the following notes about his three brothers and three sisters. OVERVIEW !! !